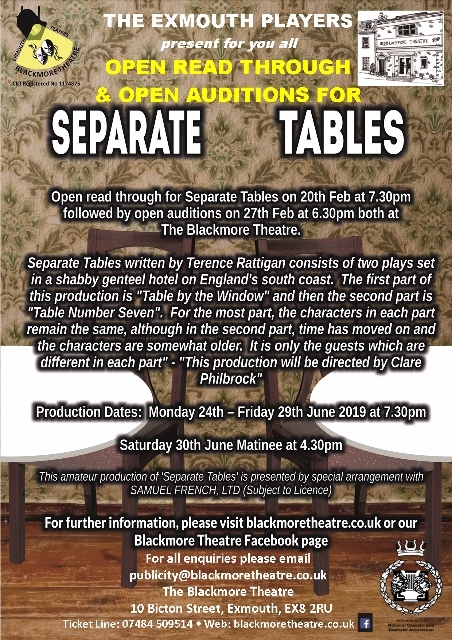 Open Read Through of Script for "Separate Tables"
The Exmouth Players present an open read through of the script for "Separate Tables" by Terence Rattigan at 7.30pm on 20th February 2019 at The Blackmore Theatre, Exmouth. This will give those of you interested in auditioning for this play a chance to read parts, get to know the play and to familiarise yourselves with the characters. The Open Auditions will be held on 27th February 2019 at 6.30pm at The Blackmore Theatre. For full information on this production including details of the characters, please click here or visit our Blackmore Theatre Facebook page.